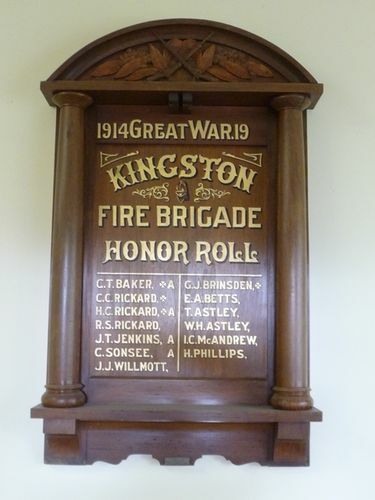 The wooden honour roll commemorates the men from the Kingston Fire Brigade who served in World War One. Chief Officer Marshall inspected the local brigade on Thursday evening, and some good times were put up by the members in the dry work events. At the conclusion an adjournment was made to the Mechanics’ Hall, where the chief object was the unveiling of the honor board. Cr F. Carter, president of the Creswick Shire Council, on behalf of the ratepayers extended a hearty welcome to Mr. Marshall. He said he was glad to be here that night to witness the ceremony. The lads who had fought for their country had to be remembered on their return and receive all the help possible. The Chief Officer thanked the president for his kind remarks, and made a very interesting speech with regard to the outbreak of the war. He then lined the members up and performed the ceremony, which was most fitting for the occasion. The board, which is very neat, is of blackwood with carvings of rifles and wattle blossoms and contains the names of 13 men, four of whom paid the supreme sacrifice. The decorations were carried out by the captain, C. H. Barker, free of charge. Ballarat Star (Vic), 3 February 1919.